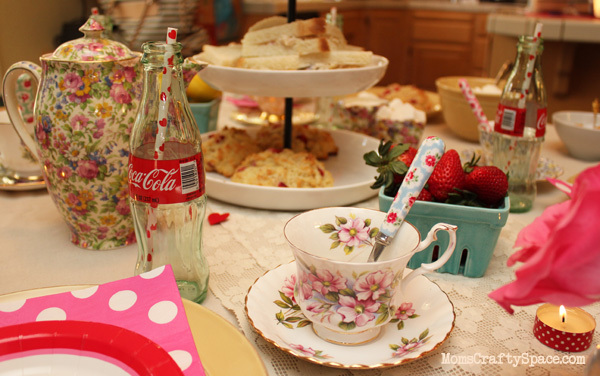 Every month or so I get together with a few of my favorite ladies to gossip and do some sort of fun project or activity. 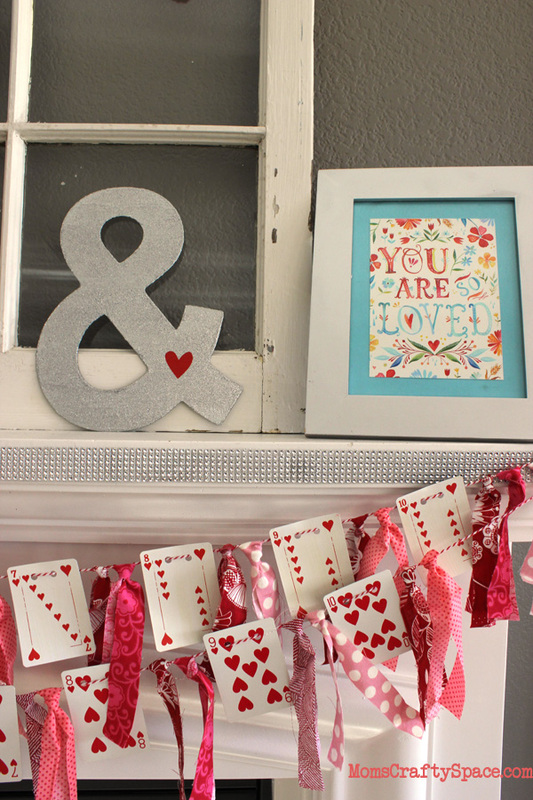 This month my cousin, Kelley, hosted the cutest Valentine’s tea party for us all, and we made a few Valentine’s Day crafts including this adorable heart card banner. I started by collecting all of the heart cards in my deck and giving them a light wash of Antique Mod Podge to take away a bit of the shockingly bright whiteness. 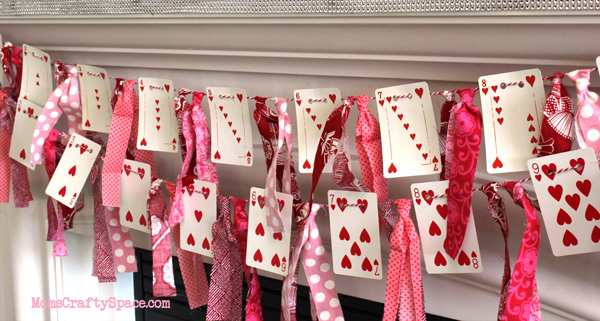 After the cards were dry, I hole punched them and strung them on a 7′ length of red and white baker’s twine. 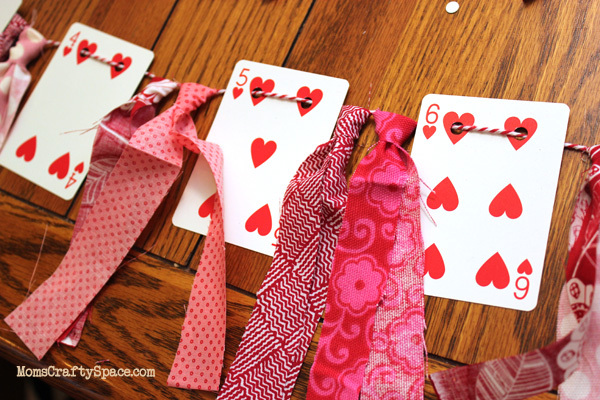 I cut around fifty 3/4″x12″ strips of fabric and tied them to the baker’s twine between each card. I had originally intended to tie three pieces of fabric between each card, but it made my garland too long, so I used three at each end and two between each card. This knot is the trick to getting both of the fabric tails to lay flat and in a downward position. So cute! 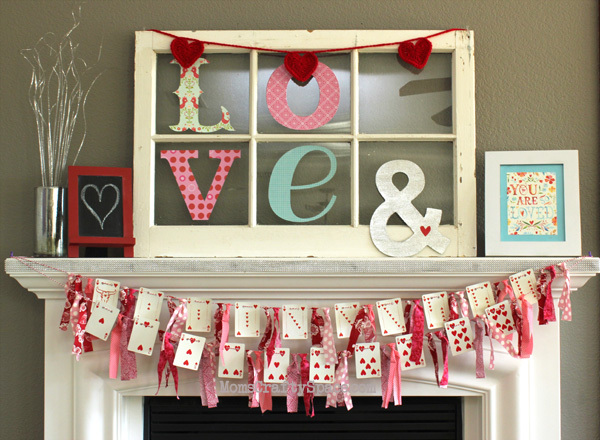 Buuut…do you know what’s even cuter than a Valentine’s Day heart card garland? 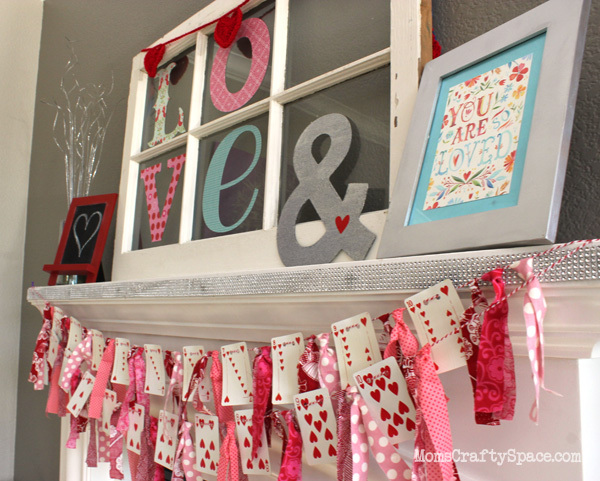 TWO Valentine’s Day heart card garlands! 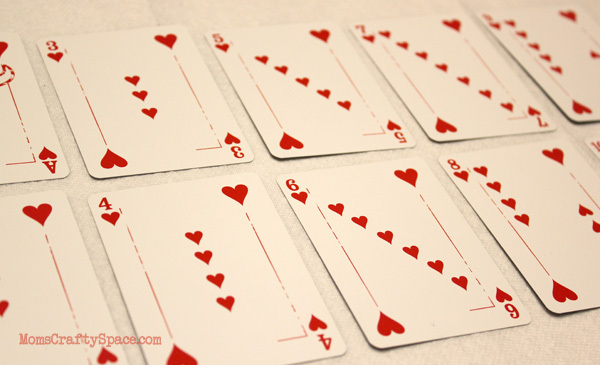 I used two decks of cards with different heart patterns, and I love the way they look together. They look so sweet up on my mantle. 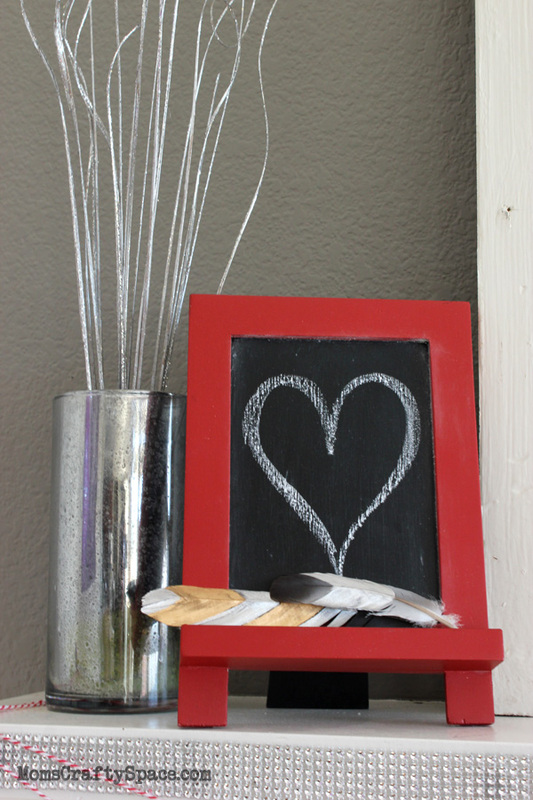 This is the first year that I’ve really done a Valentine themed mantle, and I’m totally loving it. Not sure why I never did this before! 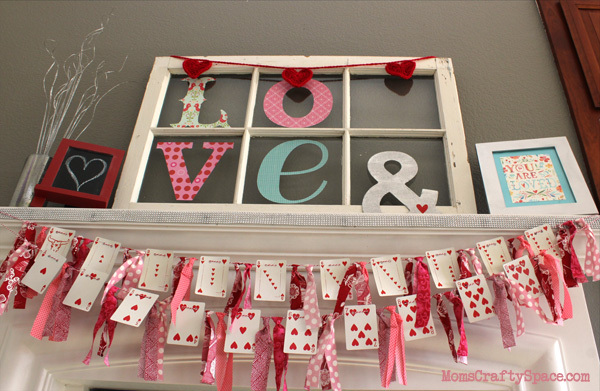 I cut L-O-V-E out of scrapbook paper and used a washable glue stick to adhere them to the glass in my vintage window frame. 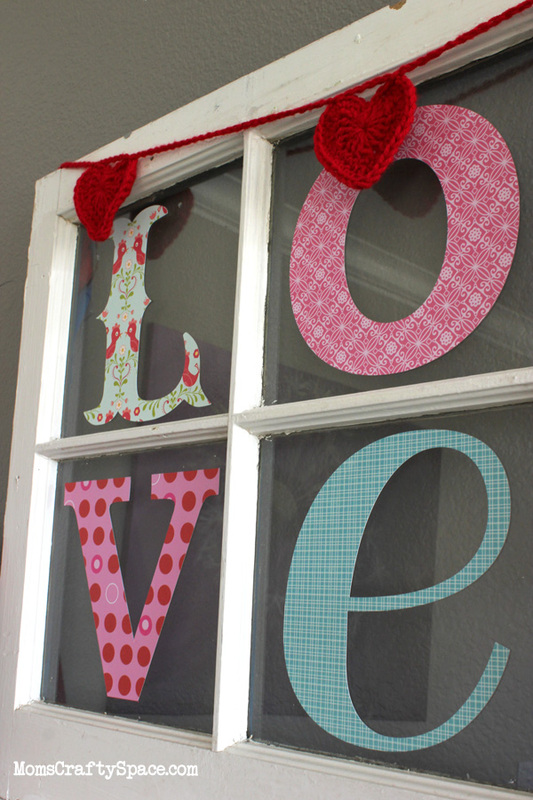 The heart garland was crocheted by a friend of mine a few years ago. The metal ampersand that received the glitter treatment last week now has a seasonal glittery heart tattoo of its own. Of course I had to throw one of my Katie Daisy prints into the mix too. So. In. Love. This is the most pink that this house full of boys has ever seen, and I like it! Gilded feathers placed on the chalkboard by one of my boys tops it all off. I almost wish that we had longer until Valentine’s Day so that I could keep enjoying all of these hearts and girly pink even longer! Oh my cuteness! I love every. single. detail. Love it! I love the playing card banner! It is so cute!! Great job on the banner! I love it and would pay some good $$ for that. This is the prettiest mantel I’ve seen in a very long time!! Love the cards! 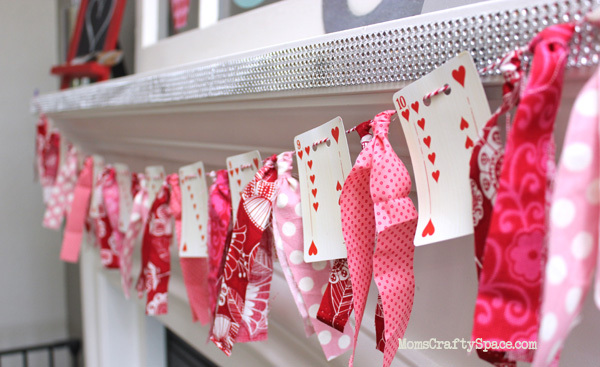 That playing card garland is genius! I love it! Reminds me of Alice in Wonderland. Beautiful mantel! Love the bunting! Such a clever idea. Thanks for sharing. I didn’t know they made antique mod podge. I need to look for it. What a fun idea for a banner! I love all the hearts cards! This mantel is adorable. Pinned your garland. Thank you so much for the inspiration! So cute! I’m making it this weekend! I’m curious to know what you used to secure your garland on your mantel? LOVE THIS! We shared this on our blog today! 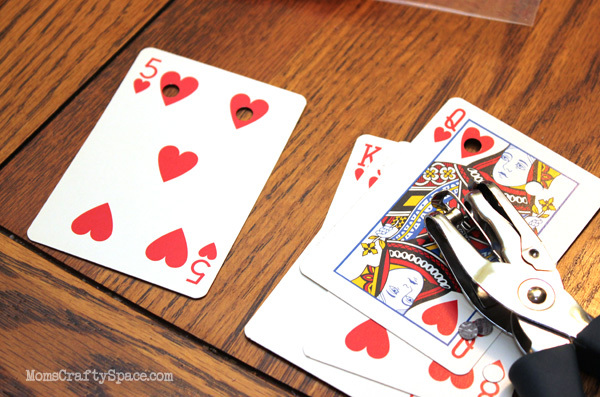 Where can I find the same type of heart playing cards? So, so cute. Love the card banner. Please where can I find those adorable playing cards❤️ Thanks so much.